This article is about building your social confidence and optimism. So you might find this next sentence a bit strange. It’s common for Buddhist monks to meditate on death. Specifically, their own death. Why would they do that? Well, Buddhists seek enlightenment, a state of blissful oneness and joy that can only emerge in a person who has relinquished all attachment to self-referential goals. By contemplating how the world will continue on without them, long after their death, these monks become less afraid, less selfish, and more interested in the unfolding beauty of the present moment. It helps them to detach from fear and take one step closer to bliss. Perhaps that’s why peak performance psychologist, Michael Gervais says, “The most powerful people in the world are those that have nothing to lose.” We tend not to get nervous when we have nothing to lose. Dr. Gervais has worked with some of the world’s top performers, like the Seattle Seahawks, Felix Baumgartner (the Red Bull athlete who completed the stratosphere Jump), Olympians, musicians, and other champions who face high-stakes performance situations for a living. So I believe he knows what he’s talking about when it comes to handling anxiety. When it comes to dating and building strong romantic relationships, this mindset can relieve a lot of stress and tension. You relax a little when you don’t feel the need to prove your worth. The actor, Matthew McConaughey explains it well in a commencement speech he gave about finding happiness. He says his acting career really took off when he stopped using his acting as a means to an end, and instead threw himself completely into the work itself. He stopped thinking about getting famous, winning awards, or gaining the approval of his peers in the acting world. Instead, he tried to find joy in the work itself. And he says that’s when he suddenly began to receive acting awards. That’s when his career really took off. Why? Because he stopped chasing happiness. The strange truth is, happiness is only a byproduct of achieving goals. But each time we achieve a goal, we just raise the bar. So happiness is a fleeting experience. Only a ripple that occurs for a short time after each new desire is achieved. Joy is a lasting sense of well-being that emerges from fully immersing ourselves in the process of living life well. In the process of working. In the process of being a good parent. In the process of meeting potential partners. In the process of inviting a partner into deeper levels of shared intimacy. Joy happens along the way. It emerges on the journey. What would happen if you became less concerned with outcomes in your romantic relationship? Would you find yourself feeling more confident as a result? An enlightened person no longer experiences the world through the typical filter the rest of us do. Through meditation, they learn to observe their own thoughts and then mentally separate themselves from the natural desires that typically drive our daily thoughts, interpretations, and emotional reactions. Maybe you’re not into meditation. But what would happen if, before your next date, you simply paused to consider what the world will be like 200 years beyond your own death? Do you think it might awaken something inside of you? Might it cause the light of your being to burn more brightly as you relinquish the need to control the future, and instead become fascinated with just this one vibrant experience of interacting with another human being? That’s one way to practice a mindset that unlocks your natural confidence. You see, Michael Gervais says confidence is a skill. You’re not born with it. You have to train it. Just like everything else, your genetics are involved, and your upbringing and environment are involved. But so are the choices you make about what gets your attention. In other words, you can train your mind toward things like optimism and confidence. But it doesn’t happen automatically just because you had parents who loved you, or just because you had 12 or more years of education. Your mindset is up to you. No one else is going to train it for you. Carol Dweck has rocketed on to the public scene with her book, Mindset. And the reason is simple. It’s a message we needed to hear. Though her book is primarily about raising children so that they love learning, there’s a deeper message in there for all of us. And the deeper message is that anxiety hampers performance and learning. Anxiety has the worst impact on kids who are labeled as “smart.” Why? Because those kids gradually develop a fixed mindset. The idea that being smart is something you are or you aren’t… and the tests will tell you which one you are. In contrast, the kids who go on to do great things, get PhD’s, and develop a lifelong love of learning are the ones who have a growth mindset. These children are encouraged to see their grades as feedback about the process of learning rather than feedback about whether or not they are a smart person. The key to decreased anxiety and increased confidence is a growth mindset. So what does this mean for your relationships? It means you should revel in the process of getting better at relationships. Focus less on future outcomes and more on getting better each day or each minute. For example, you could turn your attention to practicing good small talk skills. Or turn your attention to the skill of reading his nonverbal signals. Or simply focus on building your skill for practicing gratitude right at that moment. With time, this mindset training will become a part of your identity. And you won’t want to give it up. P.S. 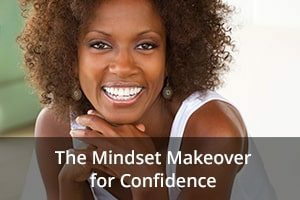 If you liked this article, you’ll love the other two articles in this series on building your natural reservoir of confidence. Choose your next step toward confidence by clicking one of the articles below. I can’t thank you enough, for sharing this article, about confidence. I never realized it was something one has to practice to fully achieve. The tips you listed, really opened my eyes to a totally new and different way of thinking and living. I’ve always wanted to start meditating, but I never understood how or why it’s done. Thanks again, for this wonderful, enlightening article.